December 8, 2013 By Allyson 40 Comments This post may contain affiliate links. Read my disclosure policy. As everyone knows, the holidays are an incredibly busy time of the year. We have Thanksgiving and then a few weeks later are celebrating Christmas. We even have my son’s birthday between the two holidays, which makes it even crazier. While I love the holidays, I also like to take time to relax and enjoy our friends, before things get too stressful. For the last few years we have taken a night off from all the stress, and had a little holiday party where we get together with our close friends, and just enjoy their company and be free of all holiday stress. I usually use this time to do some holiday baking and cooking. As my close friends know, I love cooking, so I love sharing that with them. While this year we only had around 12 people come over, it was the perfect number and we had a great time. I decided that we would have a ‘Drinks & Desserts’ theme, and I would make some tasty baked desserts and whip up a signature cocktail. Before everyone arrived, I finished baking the 4 featured desserts, including the Chocolate Almond Cheesecake Bars (scroll to bottom for recipe). Land O’ Lakes Butter was a star in this recipe and definitely helped in getting the most perfect buttery almond crust on these bars. Right as I set the cheesecake bars onto the table, I heard the doorbell ring! I was so excited for our friends to arrive and start celebrating! Everyone dug right into the desserts and drinks, and we had a great time. 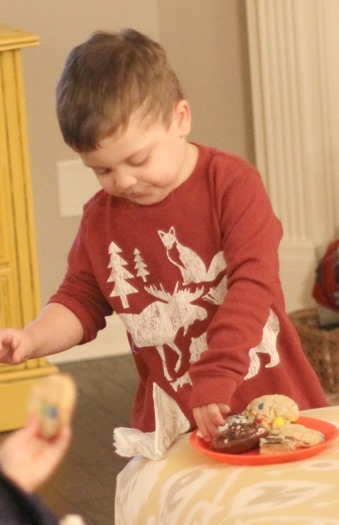 The kids kept sneaking desserts from the table and at one James had his plate overflowing! 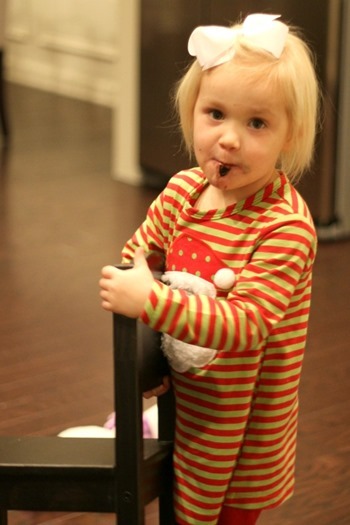 Audrey loved the chocolate truffles and there was no hiding it! After everyone was full of delicious desserts the adults chatted and watched football and the kids played and played. Being behind the camera is sometimes a pain, because you never get to be in any photos with your friends in family! 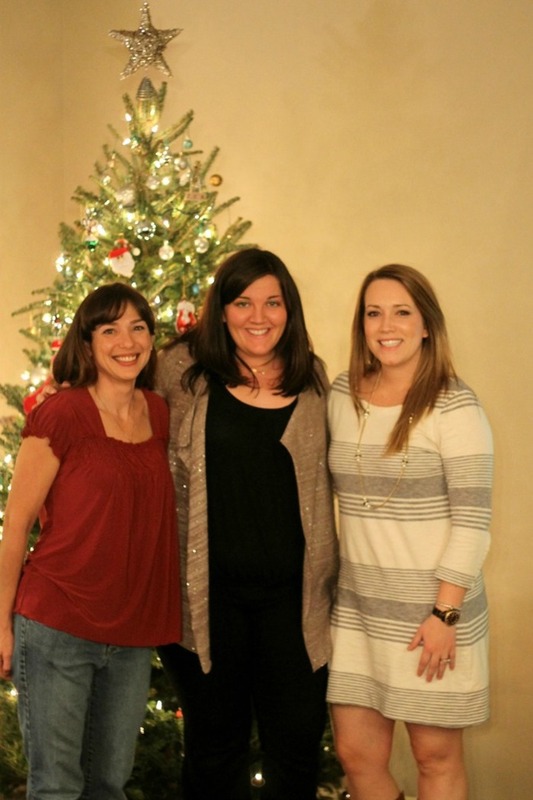 Luckily my husband volunteered to take a picture of me and my 2 friends in front of our tree. Everyone thoroughly enjoyed the drinks and desserts, and everyone could not stop talking about the Chocolate Almond Cheesecake Bars! They were by far the biggest hit, and all the husbands wanted the recipe (for their wives to cook!). 1. Combine flour, 1/4 cup ground almonds, and 1/4 tsp salt in a medium bowl. Cut in butter with a pastry blender, two knives, or a fork until mixture resembles coarse meal. 2. Coat a 8-inch square baking dish with baking spray. Sprinkle mixture into the dish and lightly press mixture into bottom of pan until firm. 3. Bake at 350° for 30 minutes or until golden. Cool crust completely on a wire rack. 1. Place cream cheeses in a medium bowl; beat with a mixer at medium speed until smooth. Add sugar, yogurt, vanilla, and dash of salt; beat at low speed until combined. Add egg; beat 1 minute or until well combined. 2. Pour mixture over cooled crust. 3. Place chocolate chips and milk in a small microwave-safe bowl. Microwave for 30 seconds or until melted, stirring after every 15 seconds; stir mixture until smooth. 4. Dollop chocolate mixture by the spoonful over cheesecake mixture; swirl together using the tip of a knife. Sprinkle with 2 tablespoons chopped almonds. 5. Bake at 325° for 30 minutes or until almost set in the middle. Cool completely on a wire rack. Cover and refrigerate 6 hours or up to overnight. Cut and serve as bars. By using lower fat cream cheese and milk in this recipe, it reduces the calories and fat. If you prefer the full fat version, go ahead and use regular cream cheese and whole milk. Using the lower fat versions did not change the taste what-so-ever in my opinion. Oh wow, this recipe sounds unbelievable. Will have to try! What great holiday photos too! 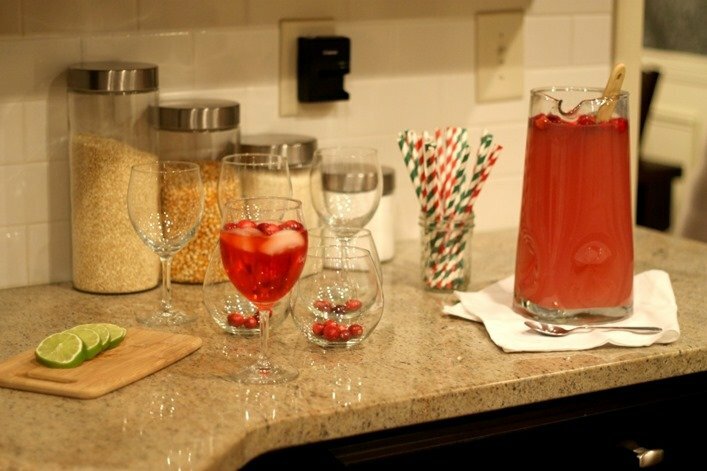 I love the idea of a drinks and desserts party. That is totally my kind of night. 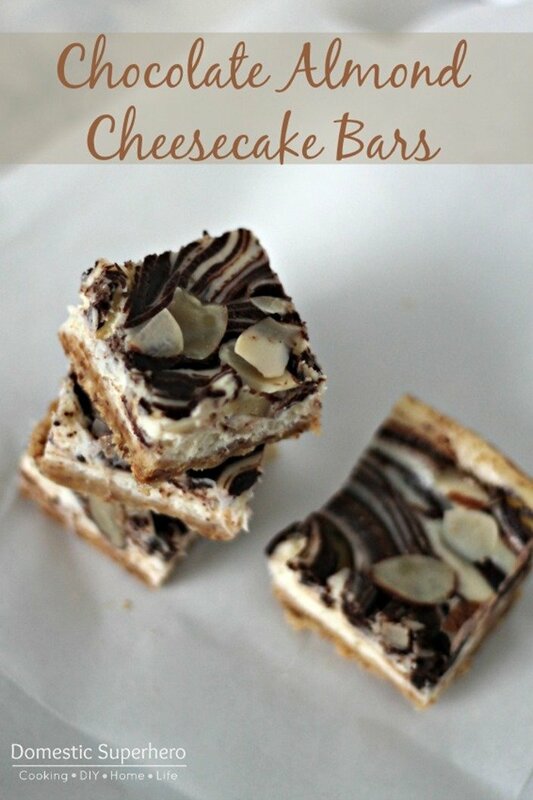 Your cheesecake bars look AMAZING! 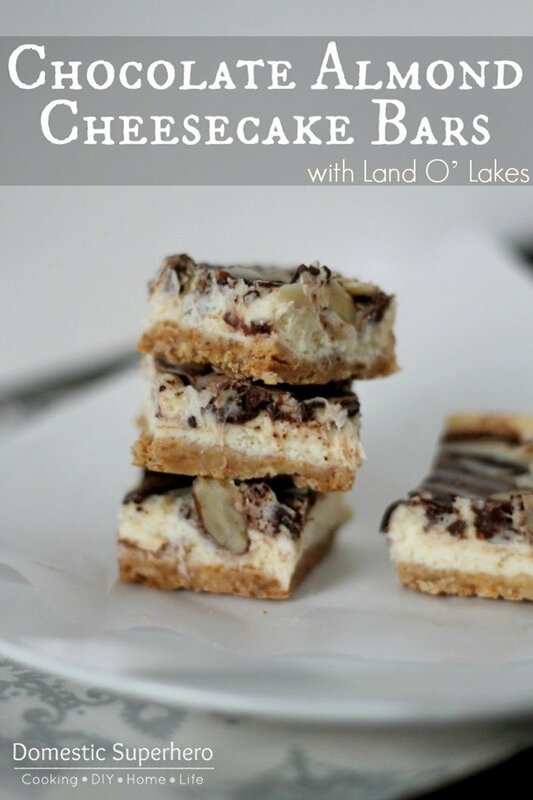 Yum, those cheesecake bars look delicious! Oh my, these look amazing! Thanks for sharing this recipe! And…looking forward to seeing your contributing posts on One Tough Mother! This will be fun! I can’t wait to see your posts, too! It will be a good time 🙂 Thanks for stopping by today! That is too yummy looking and I’m thinking I need to add an exercise program to the list! LOL Deborah! This recipe is actually reduced fat, too! i LOVE chocolate and almond together. YUMMY!! Land O’Lakes is our go-to butter brand. Always has been! Shauna you can really taste the difference with Land O’Lakes!!! I always use Land O’ Lakes, too. I must try that recipe soon. Those bars look so yummy. Sweet tooth triggered…this looks so yummy! 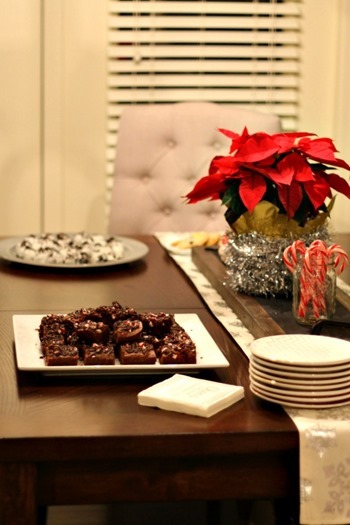 I love all your pics and those chocolate almond cheesecake bars look amazing! I entered 🙂 Yay for a great holiday get-together! Those bars look SO good! Saving this recipe! I hear ya about all that holiday stress, but those AMAZING looking cheesecake bars would definitely help me de-stress. Awesome pics, by the way! Those bars are looking yummy! 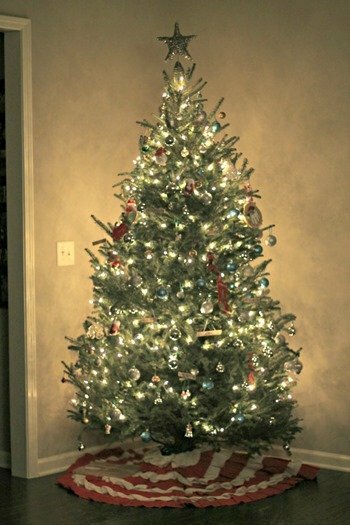 Beautiful tree- have a happy holiday! Yum! Those bars look so tasty! And looks like everyone had fun too! These look so good, and your home also looks great! Oh boy I have only a few days left before my super diet starts…I’m off to go get some ingredients YOLO as my kids would say. Your chocolate almond cheesecake bars look yummy. My kids would chow down on them. Looks like you and your friends had a great time. Thanks for sharing. You said the magic words: cheesecake and chocolate. Yum! Your home looks so inviting and your kids are adorable too! I love the recipes my boys and I are always trying to find new ones to try together. I think drink/dessert parties are so smart. They are fun, yet they cut down so much of the work of a full meal. Now these looks delicious! Yummy! These Chocolate Almond Cheesecake bars look divine! Three of my favorite things combined! Pinned (and entered)! Awesome giveaway – I could REALLY use that GC! Here is the problem. I keep wanting to EAT all these things. Then I spent Jan-March crying on my treadmill. LOL! I feel sure I’d drop anything on my calendar to attend a party with that theme and to try your recipe. YUM! It’s sad it seems the holiday season is so busy, I find it hard to make time to get together with the friends we love so much. Maybe your post will motivate me. Ohh, yum! My mouth is watering just looking at these. I love that you set aside time to enjoy your friends during the busy Christmas season. This recipe sounds delicious! I might have to whip up a batch for a gift exchange I’m going to next week. Thanks girl! Oh yum. These totally just got added to Christmas dessert.